Hi friend! It seems like winter is just unwilling to release her relentless grasp on us up here in the great white north, whether it be the 11ft of snow that’s been dumped on the east coast since January or the -35 temps here in Saskatoon, so I thought I would share one of my favourite cozy warm soup recipes. This soup has been my go-to when the weather dips below the unholy -30 threshold because the spices help warm you up from the inside out. It also contains lots of spices and nutrients to help your body rebuild and repair, fight off inflammation, and promote overall immune system balance. 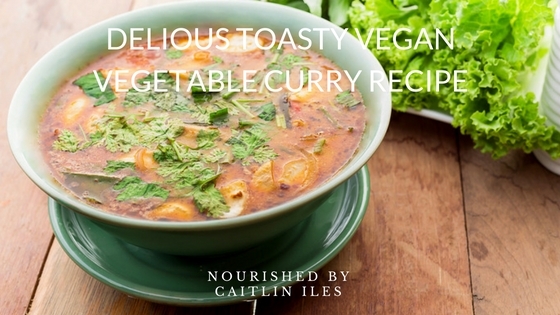 Now I know this recipe may look really complicated at first pass, but if you actually look at the ingredient list, it’s mostly spices, a few vegetables, and some stock, so really pretty simple. And the directions may seem long, but it’s all basically just chopping and adding things to the saucepan, so fear not. I have every confidence that you will breeze through this recipe and impress your family and friends with your mad kitchen skills! Just make sure you read the recipe through once before you get started. I’ve made this mistake several times and while it has resulted in some happy accidents on occasion, for the most part it ends up with wasted food and no one wants that. This delicious root vegetable is an amazing source of beta-carotene, a precursor to vitamin A. This fat soluble vitamin is required by your body for tissue growth and repair; to enhance your immunity; help keep your eyes healthy and happy; and help you grow strong bones, hair, teeth, skin, and gums. Whew, what a superhero of a nutrient! Beta-carotene, before it is converted to vitamin A, is also used as an antioxidant in the body, which means it’s great for mitigating oxidative damage caused by free radicals (unstable compounds with an unpaired electron) in the body. Minimizing free radical damage helps you recover from workouts faster and keeps you looking fresh and healthy longer. This spice, which is common in most Indian cuisine, comes from the vibrant yellow turmeric root. It contains a compound called curcumin, which has amazing anti-inflammatory and antioxidant effects in the body. Adding turmeric to your diet is a great way to help alleviate pain from arthritis, support your neurological function, and help with liver detoxification. I’m not sure I use any spice in my cupboard as much as cinnamon. It just adds such a beautiful depth of flavour to sweet and savory dishes. It turns out the volatile oils responsible for the delightfully homey and delicious scent that characterizes this spice contain amazing antimicrobial effects to help ward off any nasty bacteria that may be weakening your immune system. Cinnamon also helps balance blood sugar by making the cells in your body more receptive to the effects of insulin, which means the sugar you eat in conjunction with cinnamon will be absorbed quicker. No wonder cinnamon and sweet potatoes taste so great together! I’m sure you remember your mum giving you glasses of flat ginger ale when you had tummy aches because of the widely documented benefits of this root in alleviating gastrointestinal distress and improving digestion. But ginger is not just a one trick pony! It also has fantastic anti-inflammatory properties and inhibits the formation of inflammatory compounds in the body thanks to compounds it contains called gingerols. Adding ginger to your diet can help alleviate aches and pains in your body, keeping you active throughout your long life. So you can see that this soup contains all the right ingredients to make this the perfect anti-inflammatory meal! Just add your protein of choice to round it out. Place a 4 to 5 L saucepan on the stove and turn heat to 3. Add all spices from madras curry to garam masala into the dry (no oil please!) saucepan, mix thoroughly, and cover with the lid. As spices are toasting dice onion into bite-sized pieces. Check spices after about 2 minutes. Once they become incredibly aromatic and maybe even begin to smoke slightly, add the onions, stir, and replace the lid. Continue chopping: garlic, ginger, and celery, adding them to the pot as you finish and stirring them into the mixture. Make sure you replace the lid between each addition. As the other ingredients char, chop cauliflower and sweet potato into bite-sized florets and cubes. Add to the pot. Stir all ingredients together until all veggies are coated with the deliciously fragrant spice mix and recover the saucepan. Do not be afraid if you see spices beginning to darken and stick to the bottom of the saucepan. That will only add even more complex and delicious flavours! After all the veggies have melded together for about 2-3 minutes, pour in the broth and stir, making sure to scrape off any spices that have stuck to the bottom of the pot. This is when you would add the lentils if you were using them. Add 2 cups. Turn heat to 7 and bring the soup to a slow boil. Once boiling, reduce heat to 2 and let simmer 20-30 minutes until the cauliflower and sweet potatoes are fork tender, meaning you can pierce them with a fork. Season with salt, tasting until you get to your desired salt level. I suggest starting with 1 tsp. and building from there. Top each bowl with a squeeze of lime, a couple of stalks of cilantro, and a small sprinkling of green onion. I like to add shredded chicken breast, pre-seasoned ground beef or any other protein I have lying around my fridge to make this soup into a complete meal. If you don’t eat meat, this soup is DIVINE with red & green lentils. Just add an extra cup of broth/water for every cup of lentils. Or don’t and then the soup will become more like a stew. So there you have it friend! A toasty, amazingly aromatic, hearty, and delicious soup to help warm you up from the inside out. Have a wonderfully whimsical weekend!